The bluebells are out at Wisley, littering the woodland floor with cyan blue – I was thinking just how much it would cost – in time and money – for us gardeners to recreate the scene when Nature seems to manage quite happily by herself. 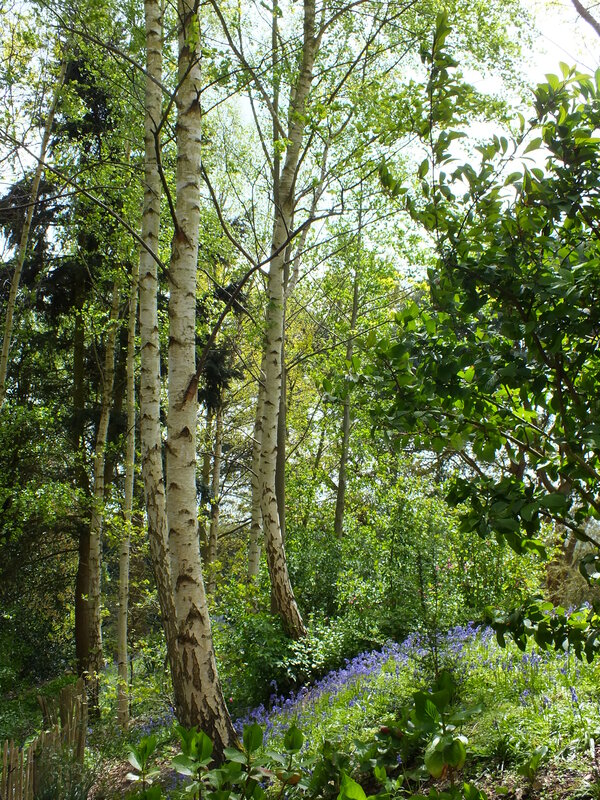 So much of the gardens at Wisley are tended and manicured – much in these woods too – but the bluebells have a very natural air to them. Up in the tree canopy, you might glean the blue of a clambering, rambling Wisteria – given free rein. Not flowering extravagantly (we gardeners know that some tough love is needed to achieve the best displays) but au naturel amongst the birch trees. 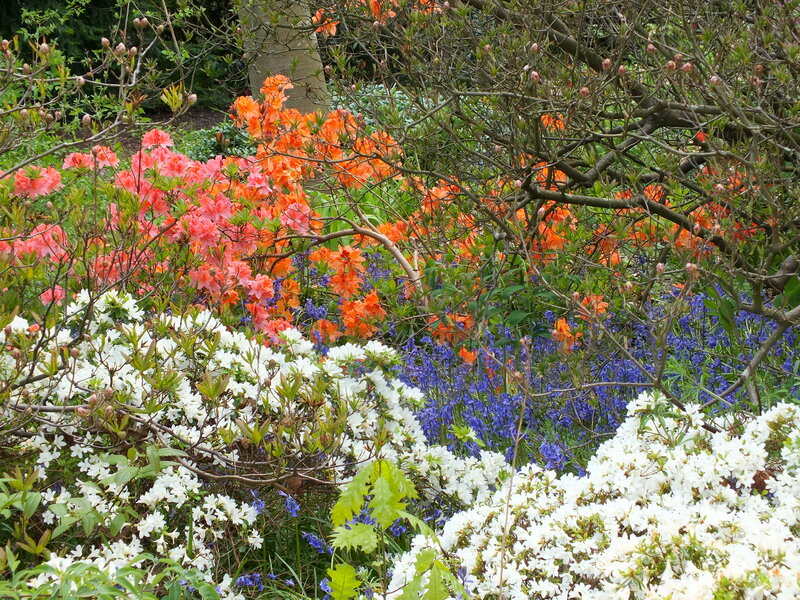 Contrasting elsewhere with the rhododendrons and azaleas, the display is altogether different – technicolour dreamery – and against the oranges, sublime. If only you could freeze-frame the moment when the first wild bluebells appear and display their arching sprays of cobalt blue flowers. They appear just as the bright green leafy canopy opens above them as if by magic. Although it’s illegal to dig them up, you can still recreate this explosion of electrifying violet-blue in your garden because reputable bulb nurseries now sell our native bluebell, Hyacinthoides non-scripta. Britain is fortunate to have half the world’s population of this woodlander and in 2002 it was voted the nation’s favourite wild flower in a poll organised by conservation charity Plantlife. I love them for their intense colour, sweet scent and the graceful arch of the stems that stoop under the weight of the bells. 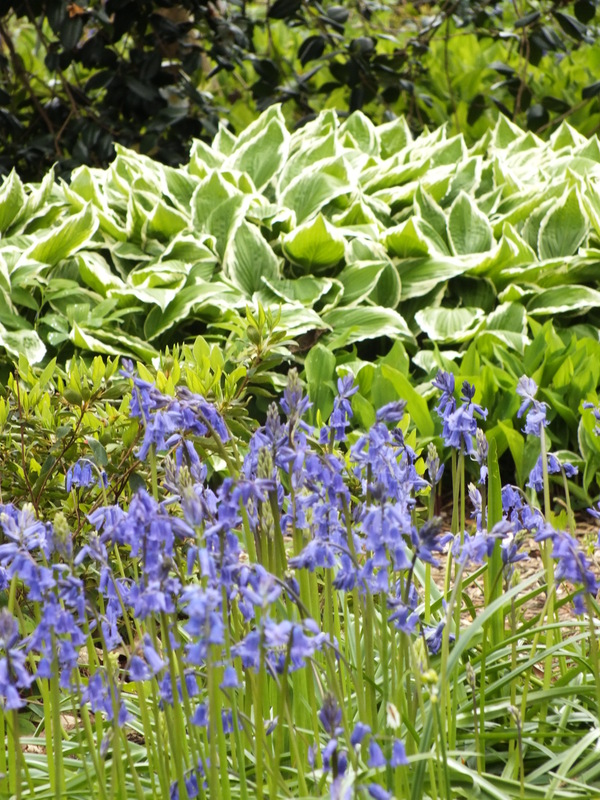 Most gardens, however, probably support the Spanish bluebell Hyacinthoides hispanica. This has wishy-washy, grey-blue, upright spikes with little charm. Introduced in 1680, it is almost impossible to eradicate because bluebell bulbs drive deep into the ground. So having failed to dig them out, many gardeners are forced to tolerate them. Hundreds of bone-white bulbs find their way onto compost heaps and into landfill sites every year. This tough customer survives it all and, even after years on a compost heap, it lives to fight another day. I would argue that the grey-blue Spanish army isn’t just bad news visually. The bees carry pollen from the invader to truly native colonies and strong, vigorous hybrids appear, ruining the authenticity of the native strain. Hybrids were first identified in 1963 and most colonies close to urban areas contain them. More remote colonies are purer and must stay that way because keeping native plant species intact is vital for biodiversity. Native flora and fauna are indelibly linked. Once a species is lost, it’s gone forever and this has a knock-on effect. This interdependency between natives was brought home to me when photographing a lacewing larva feeding on aphids. Two blue scabious species grew close together and their stems were entwined. One was the native field scabious (Knautia arvensis), which produces powder-blue pincushions from late July, often on grassy verges. The other was a larger, frilly-flowered, late alien species originally from the Caucasus, Scabiosa caucasica. To get a clear photograph the stems had to be separated. It soon became clear that all the aphids were feeding on the native K. arvensis and not the alien S. caucasica. This is significant because the lower orders of life underpin the natural world and they make selections. 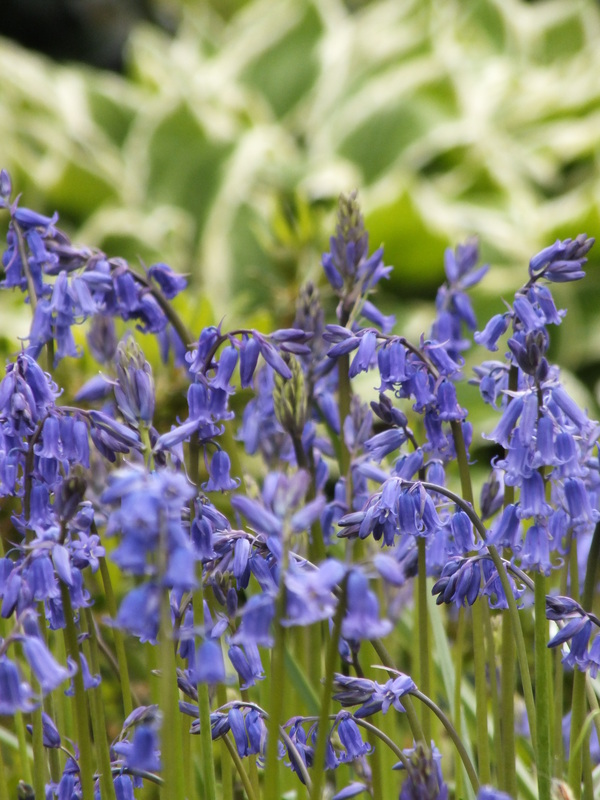 Certain native insects and bees rely heavily on our native bluebell simply because they have evolved together. 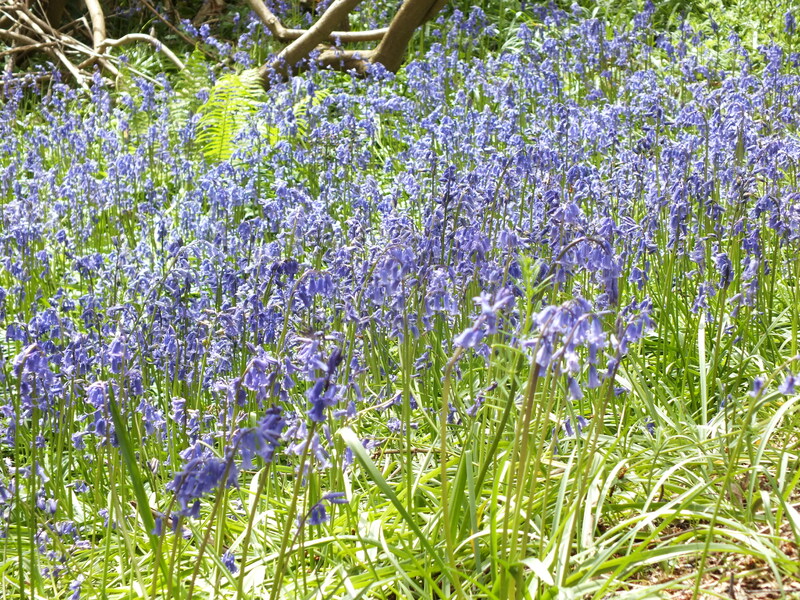 So if you live near a glorious bluebell wood and you are considering planting some in the near future, it’s imperative that you plant our native species – Hyacinthoides non-scripta rather than the Spanish interloper. The best way to guarantee authenticity is to buy them from a reputable source. If you are at a nursery or garden centre check for the vivid violet-blue colour and the arching stem of flowers held on one side – all hanging downwards. The handsome, upright crosiers of the male fern (Dryopteris filix-mas) unfurl just as the bluebells are in flower. Good forms include the smaller ‘Crispa Cristata‘ (which has neatly crested fronds) and the larger, bushier ‘Grandiceps Wills’. Himalayan forms of Dryopteris wallichiana (Wallich’s fern) have black hairs that look sensational next to violet-blue bluebells. As the fronds mature they cover the foliage. The nodding flowers of the geums usually flower at the same time. ‘Herterton Primrose’ is clear yellow, or you could use the softer, buff-coloured ‘Beech House Apricot’. Both enjoy some shade. The golden grass Milium effusum ‘Aureum’, called Bowles’ golden grass, sends out beaded awns. This self-seeds and tolerates shade, but don’t confuse it with Bowles’ golden sedge (Carex elata ‘Aurea’) which needs a lot of moisture. 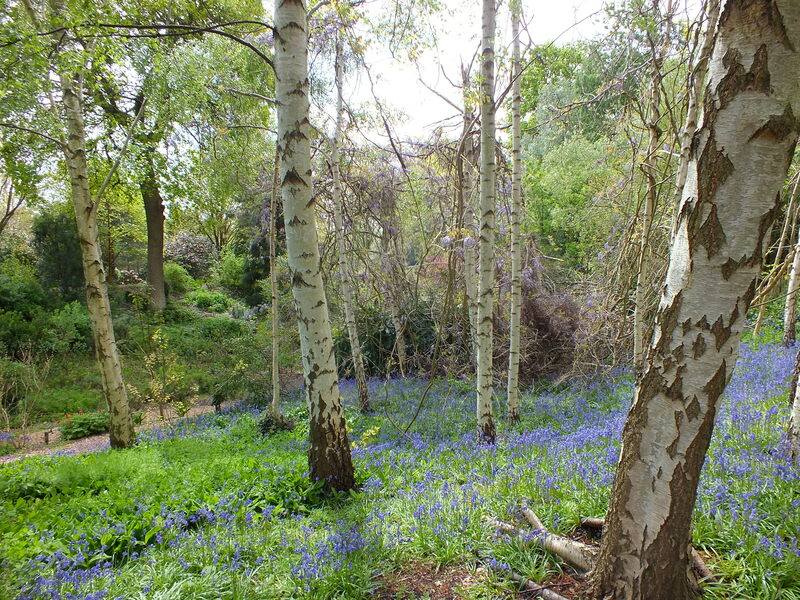 Bluebells flower under deciduous trees – most notably under native beech – Fagus sylvatica. In the garden they can be planted under green-leaved deciduous shrubs and trees. These might include an ornamental cherry such as Prunus ‘Kursar’, or the shrubbier guelder rose Viburnum opulus. Bulbs can be bought in the green and then it’s possible to check that you have the correct plant by looking at the colour and flower. These are planted in spring, watered and left to naturalise. Plant single bulbs if possible. 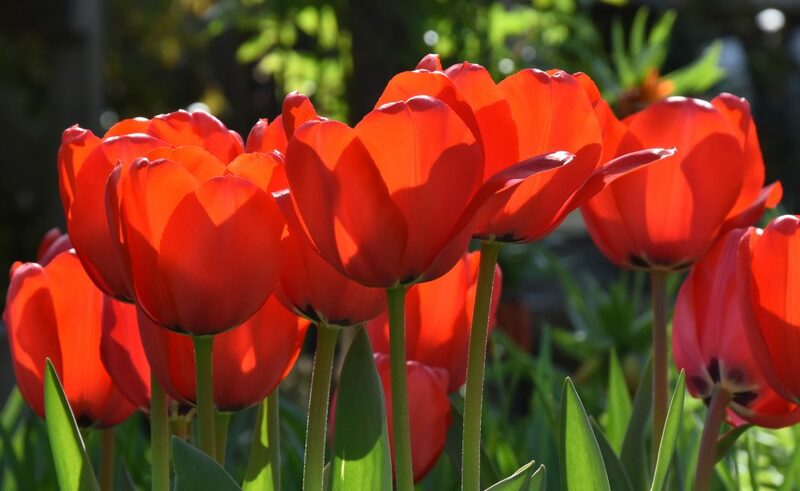 Dry bulbs are available in autumn and should be planted as soon as possible at twice the depth of the bulb. 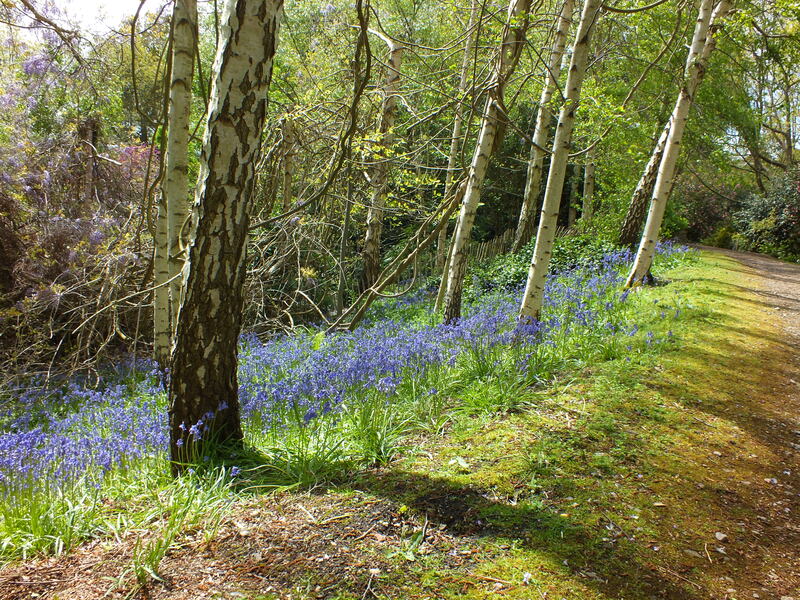 Once planted, bluebells return as long as soil is well drained and not waterlogged in winter.